Celebrity endorsements are less likely to sway Chinese millennials than the opinions of parents, scientists and business leaders—and they are the most prolific sharers of online content—new research shows. Defining millennials as those aged between 18 and 34, research carried out on behalf of agency Text100 also shows 73 percent of them are in full-time employment, boosting their spending power. The researchers surveyed 1,004 millennial Chinese (excluding Hong Kong) via online questionnaire in February. The research "paints a picture of a generation growing in confidence, connectivity and not least buying power," the company stated. "The implications for brands and marketers are clear: they need to be engaged on their own terms, and with content that is compelling." The research also shows that they are more practical, connected and interested in current affairs than their global counterparts, seeing themselves as a generation of liberal, honest, forward-looking, pragmatists who reject superficiality, self-righteousness and laziness. Almost 40 percent of those surveyed by Redshift Research would like to be successful entrepreneurs, while comparatively few harbour any ambitions to be film or pop stars. Comparisons with similar research conducted by Redshift in Hong Kong, the US and the UK show mainland Chinese millennials to be among the most connected, enjoying the world’s highest smartphone penetration at 97 percent. 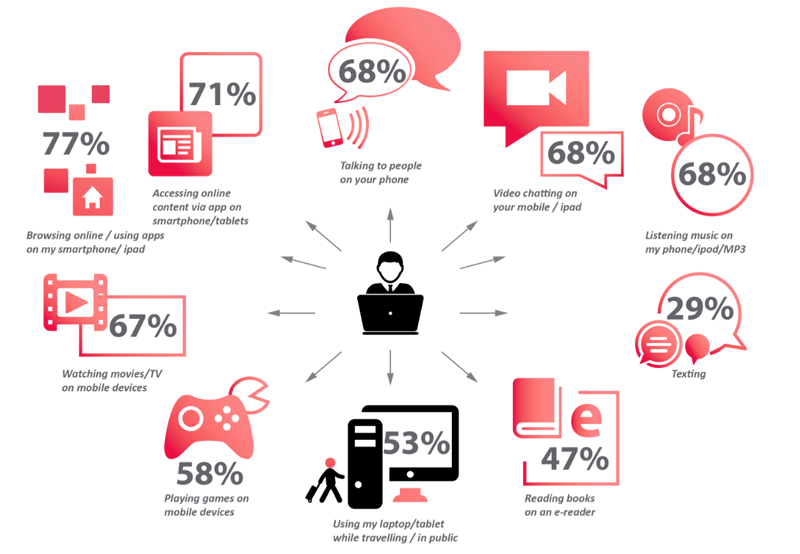 They are also the most intensive web users of the fours markets surveyed, watching more movies and TV, playing more games, downloading more content and using more apps than their counterparts in the UK, US and Hong Kong. Crucially for communicators, mainland Chinese millennials are more likely to share online content than their peers overseas. Funny content tops their list of content worth sharing, but work/study-related information, news and technology follow closely behind. Each of these categories beats celebrity information, "giving lie to the myth that all millennials care about is the superficial," according to Text100. "This strong sharing behavior is markedly more pronounced than elsewhere—even when compared to Hong Kong," the company reported. Written content remains the most common form of content shared, closely followed by photos and video. Mainland Chinese millennials also have a stronger interest in news and current affairs than people of the same age in the US, UK or Hong Kong, with 35 percent of Chinese millennials listing news as one of their interests. This is significantly higher than the UK (26 percent), Hong Kong (23 percent) and the US (18 percent). Moreover, 62 percent of Chinese millennials say they spend at least an hour a week looking at news websites, higher than for Hong Kong (53 percent), the UK (52 percent) and US (37 percent).